Mahagauri is the eighth form of Navadurga. She is worshipped on the eighth day or Durga Ashtami day during Navaratri. 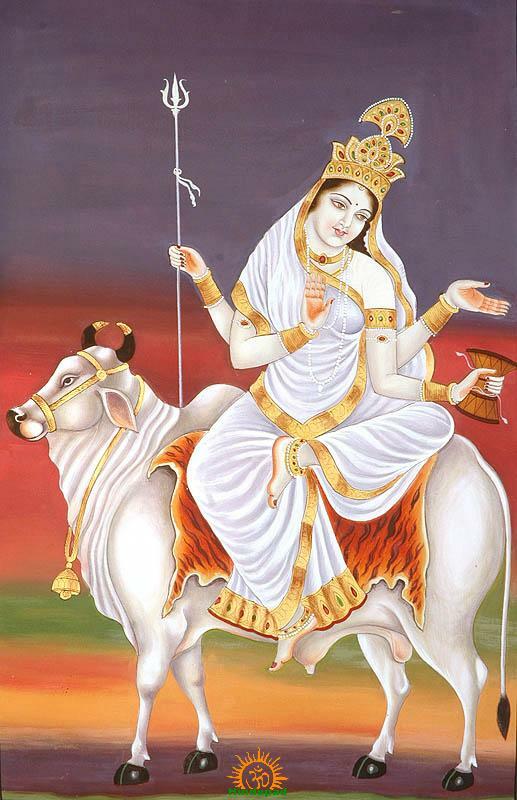 In 2018, Mahagauri Puja date is October 17. During Vasant Navratri Maha Gauri Puja date is March 25. Mahagauri is extremely fair in her body complexion. Hence she is compared with the conch and Moon. Maha Gauri Mata is always idolized as eight year old girl. All her garments and ornaments or jewellery she wears are also white. Mahagauri Maa has four arms hence called as Chaturbhuji. She rides a bullock. She holds a Trishul (trident) with right upper hand and Damaru (drum) with left upper hand. Her both lower hands are in Abhaya and Varada mudra (blessing and boon granting postures). She remains calm and serene. Maha gowri puja during Navaratras is very important one for Yogis and sadhaks. Her worship or Maha gowri puja during Navaratras is very important one for Yogis and sadhaks. Her worship or rememberance or meditation of Mahagowri makes the devotee free from his material world and keeps him stay away from sorrows. She leads her bhakt to the path of virtue. Mahagowri dhyana mantram or slokam is recited on the eighth day during Navaratras.